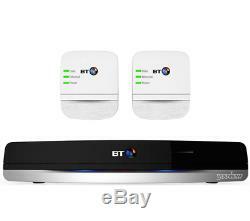 BT Youview Plus Set Top Box & Broadband Extender 600 Kit Bundle. 1 x BT Youview+ Set Top Box (500Gb) Recorder with Twin HD Freeview and 7 Day Catch Up TV. 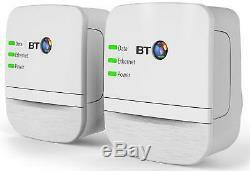 1 x BT Broadband Extender 600 Kit. BT Youview+ Set Top Box. BT's new Youview+ Box is sleeker and more compact than ever and operates even faster for a more responsive TV experience with no noisy fan to distract your viewing. No subscription is required and you can scroll back 7 days in your programme guide and watch catch up TV on your TV. You can pause and rewind TV and record up to 300 hours of TV. You can even set up recordings from your Iphone or Android smartphone. Go to the huge On Demand library and access all the content from BBC Iplayer, ITV Player, 4OD, Demand 5, Milkshake and many more. Continual 2 hour recording buffer. 1HDMI output (one cable included). Remote control batteries required: 2 x AAA (included). Size H4.3, W24, D15.2cm. 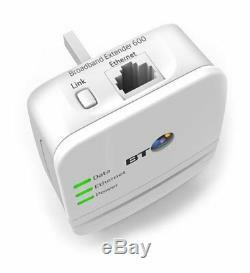 BT Broadband Extender 600 Kit. Works with any Broadband provider. BT's Broadband Extender 600 Kit has been designed to work with any service provider to make sure everyone can make the most of their Broadband at home. Plug & Play - No installation required. BTs Broadband Extender 600 Kit is so easy to use, All you need to do is plug one unit into your wall socket and connect it to your router, and the other into your wall socket wherever you need it in the house, and connect it to your devices with an ethernet cable, and you are ready to enjoy a complete broadband experience. With BTs Broadband Extender 600 Kit, you can freely move the additional plug around the home to suit your needs, simply plug it into the wall and connect up a wired device to enable internet, you are able to connect any wired device wherever and whenever you like. BT's Broadband Extender 600 Kit can support all your online needs with up to 500 Mbps for smooth HD/3D streaming, online gaming or faster downloads. Make the most of your Broadband. BT's Broadband Extender 600 Kit will help you solve a variety of broadband problems you might have around your home. Connecting up a PC for an online gaming experience or Smart TV, freeview boxes and laptops that don't have Wi-Fi capability. BT's Broadband Extender 600 Kit will help you alleviate these problems and make the most out of your broadband at home. It is also compatible with a few other AV HomePlug powerlines so you can add them to an existing network in your home. The Broadband Extender 600 Kit utilizes HomePlug AV500 Powerline technology, however this can still be integrated with AV200 technology in your home. Eco credentials come as standard with built-in power saving and fully recyclable packaging. We regret that we are unable to despatch goods outside of the United Kingdom. A large proportion of these items have never been used. They have been checked, inspected, repaired (if necessary), graded and reboxed (if necessary). They may have minor cosmetic marks that do not affect or hinder the functionailty in any way. All refurbished items will be clearly marked in the description. In most cases the item will still be in the original retail packaging which may be damaged, marked or scuffed. DPD and Parcel Force deliveries MUST be signed for. We regret that we are only able to despatch goods to the United Kingdom. All our refurbished phones (excluding corded phones) are supplied with batteries that have been tested to ensure they hold a charge however we cannot guarantee that the manufacturers advertised maximum battery life can be achieved. Batteries are a consumable item and may need to be replaced within the lifetime of the product. The new items are products that were previously available through retail stores but have now been discontinued. They come complete with all the necessary parts and accessories and are still in their original packaging. In some instances the packaging may be damaged, but don't let that put you off! They have been checked, inspected, repaired (if necessary), graded and reboxed complete with all accessories. User guides, USB/Data cables and software, if available, will be included but this is NOT guaranteed so please do not place an order if your level of expectation is that these are required. Our listed prices include VAT at the standard rate. DPD deliveries MUST be signed for. How do I check the status of my order? We will send out additional emails to let you know how your order is progressing. You must also have taken reasonable care to not mark or damage the product. The item "BT Youview Plus Set Top Box & Broadband Extender 600 Kit Bundle" is in sale since Thursday, December 13, 2018. This item is in the category "Sound & Vision\TV Reception & Set-Top Boxes\Freeview Boxes". The seller is "the_phone_outlet" and is located in UK. This item can be shipped to United Kingdom.